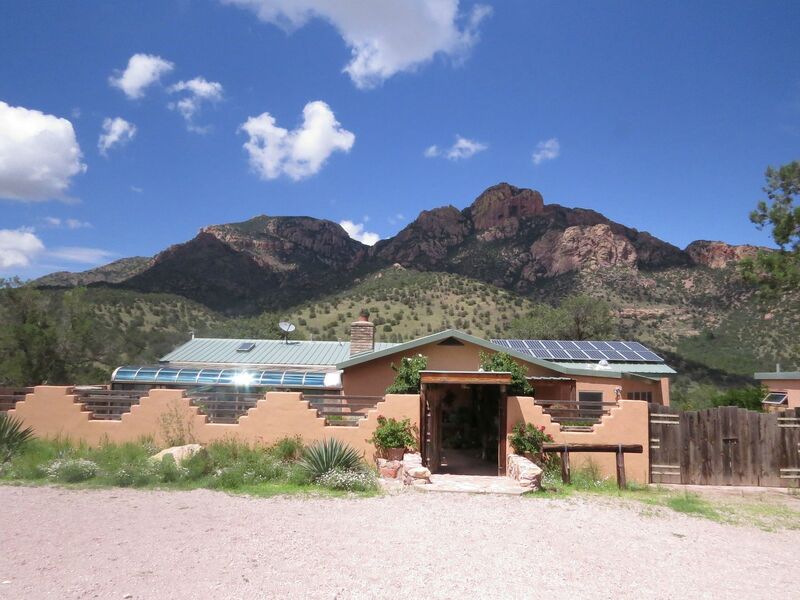 An incredible highlight of the Ants of the Southwest course was a visit to Ray Mendez's house. Here is his house, and that's the view he gets to wake up to every morning. Inside he has some interesting artwork hanging from the ceiling. But you might be asking, what makes Ray so special? 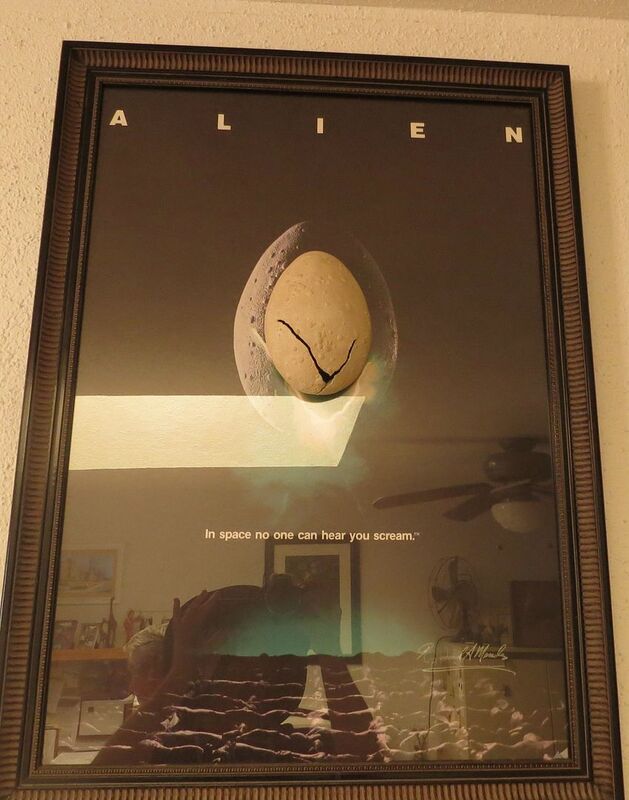 He made the alien egg and worked on some of the effects for the movie "Alien." 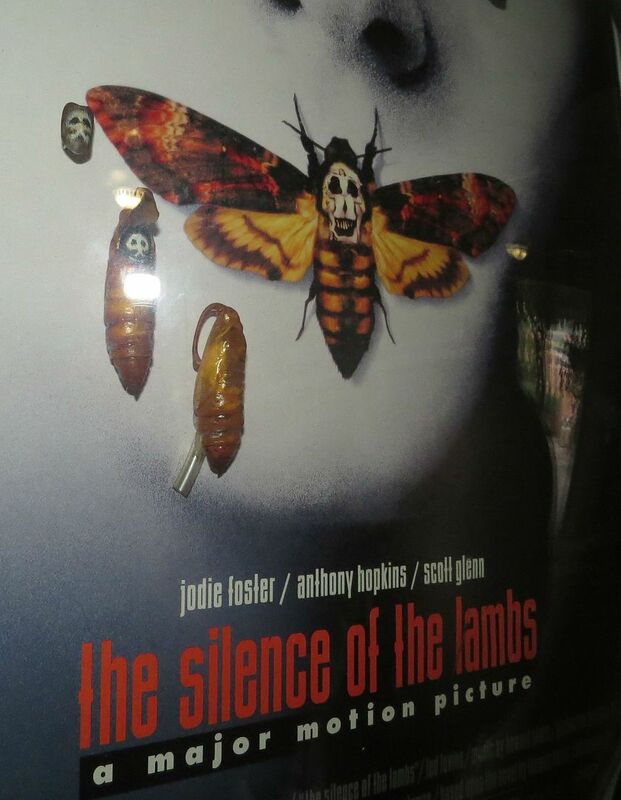 He also helped inspired what has to be the greatest tagline for a horror movie in cinema history. "In space no one can hear you scream." 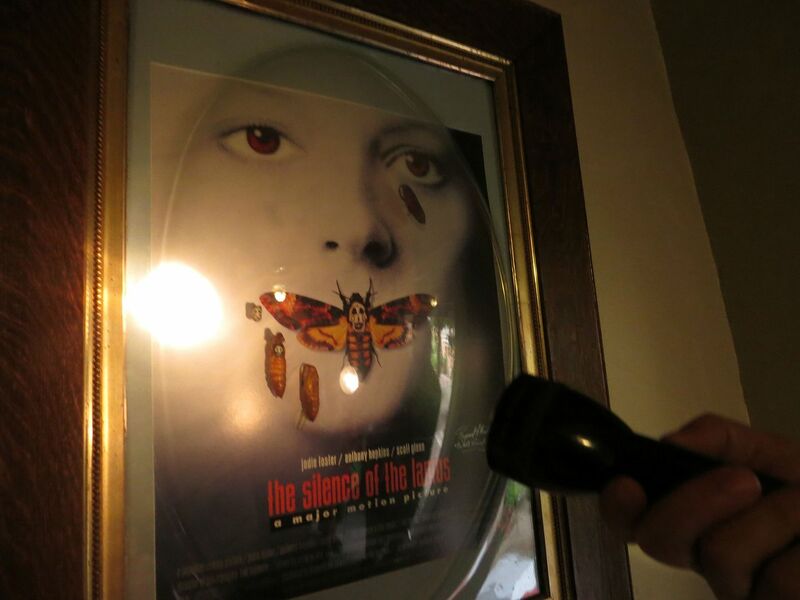 He did the bug work for the film, "Silence of the Lambs." It's actually a cockroach done up to be a moth. His portfolio includes a smattering of advertising campaigns. 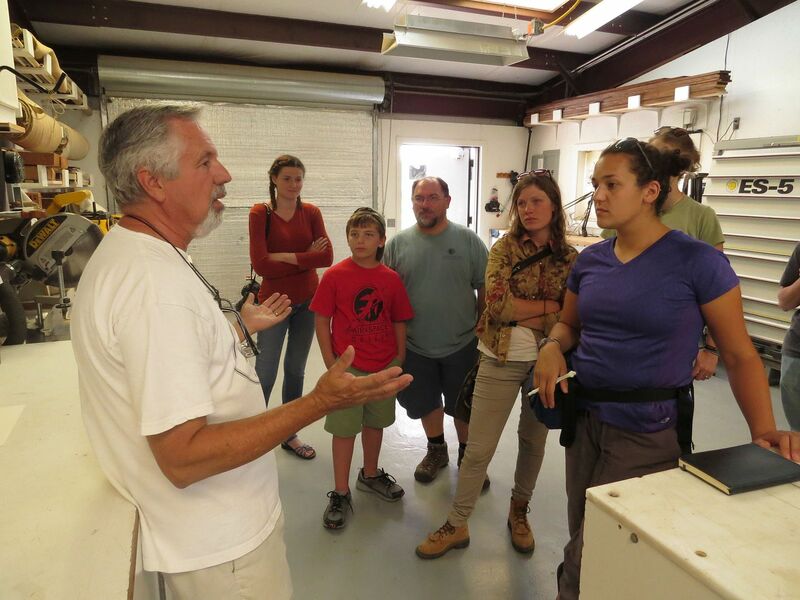 Here Ray bestows his wisdom to the Ants of the Southwest class in his workshop. 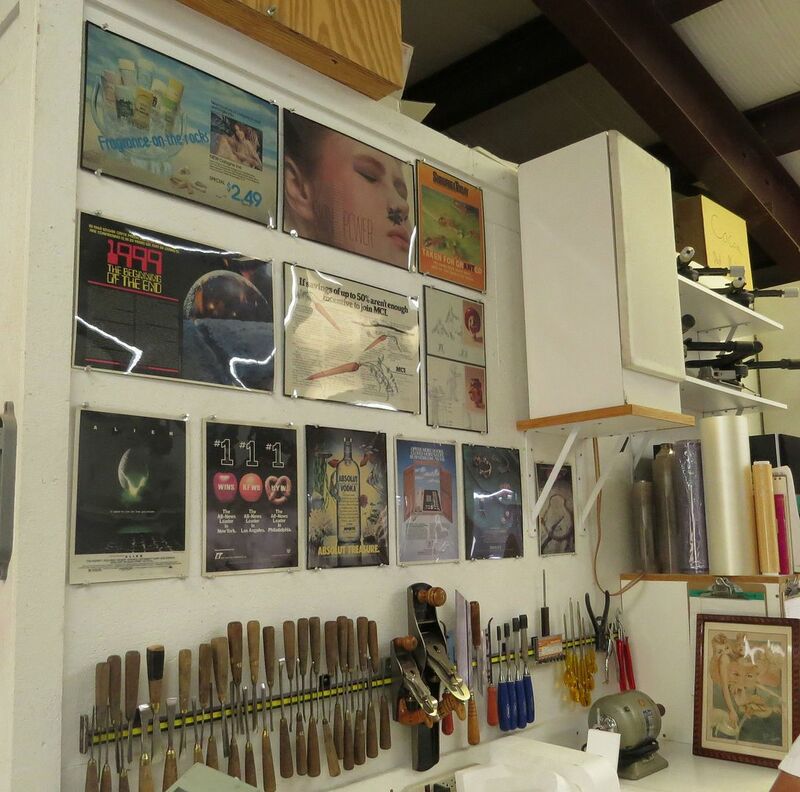 He also builds professional grade setups for museum exhibits and sets used for documentations to film. 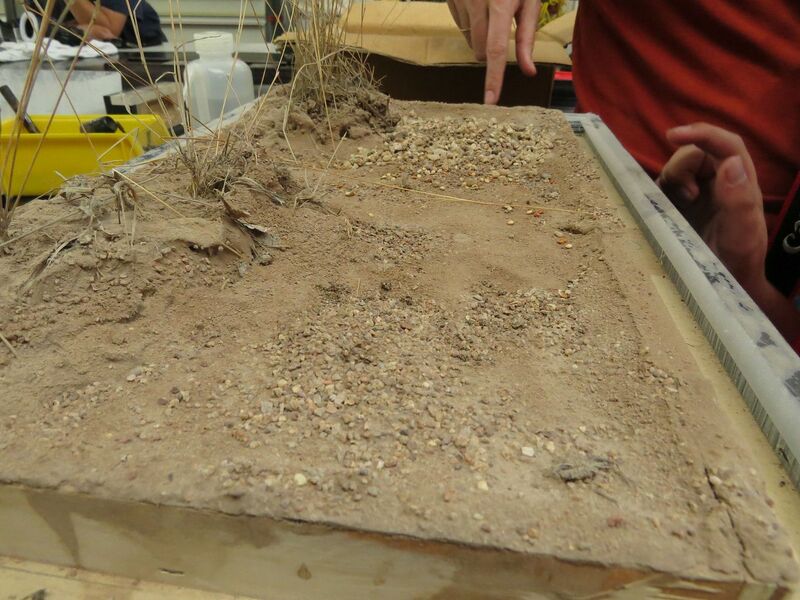 Pictured above is an above ground scene used in "Empire of the Desert Ants" a few years ago. It's hard to see but there are two openings leading down beneath the setup. 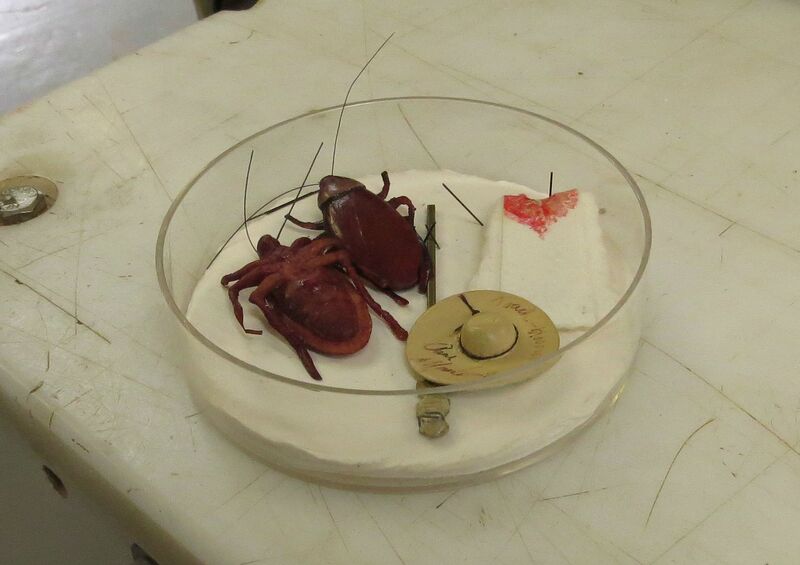 Two different colonies can be hooked up here and their interactions filmed. For the documentary they filmed both the demise of the main colony, as well as the main colony conquering anther nest all at the same time. 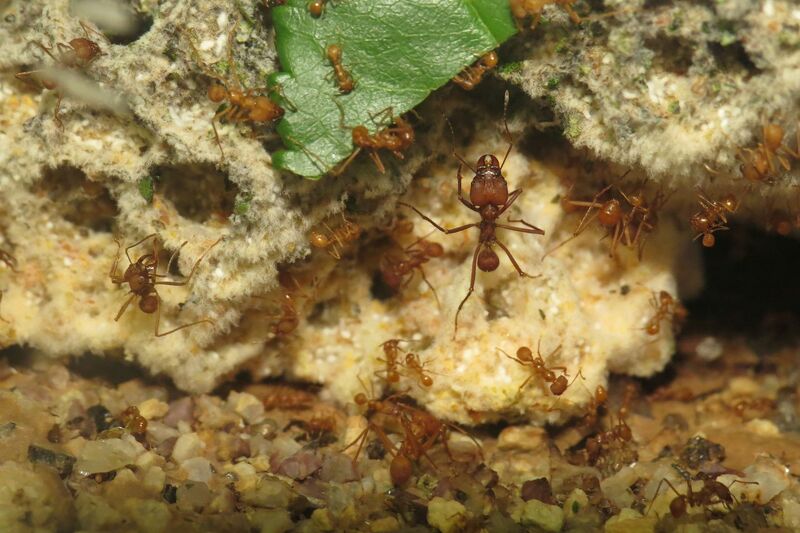 Because the ants of both colonies look identical you don't know that you're looking at two separate colonies. 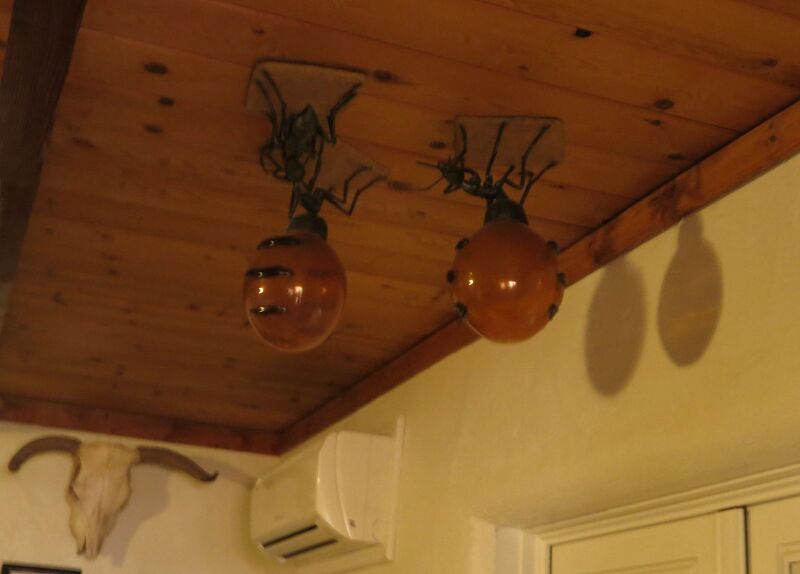 For these setups, whole nests can be attached underneath. This allows camera men to film the workers right as they emerge from the hole. 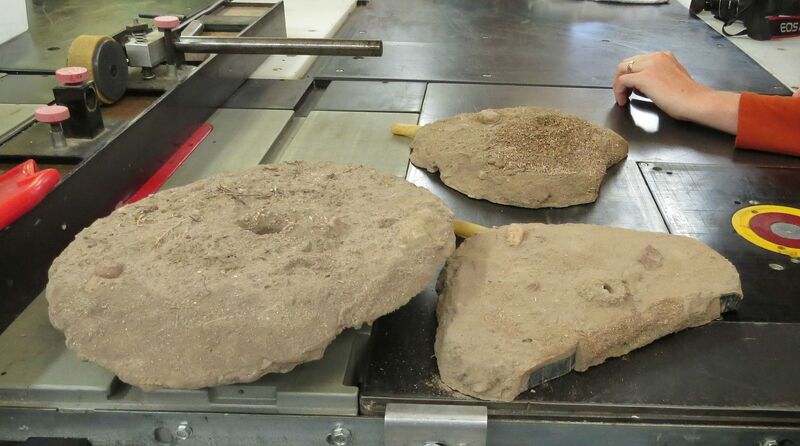 The whole setup as well as the disk can also be buried in the ground and blended in with the surrounding soil. This way filmmakers can have an ant nest in an ideal location for both lighting, background, and ambiance. Here are two nest setups placed side to side. Each one is its own chamber to help with a movie trick. 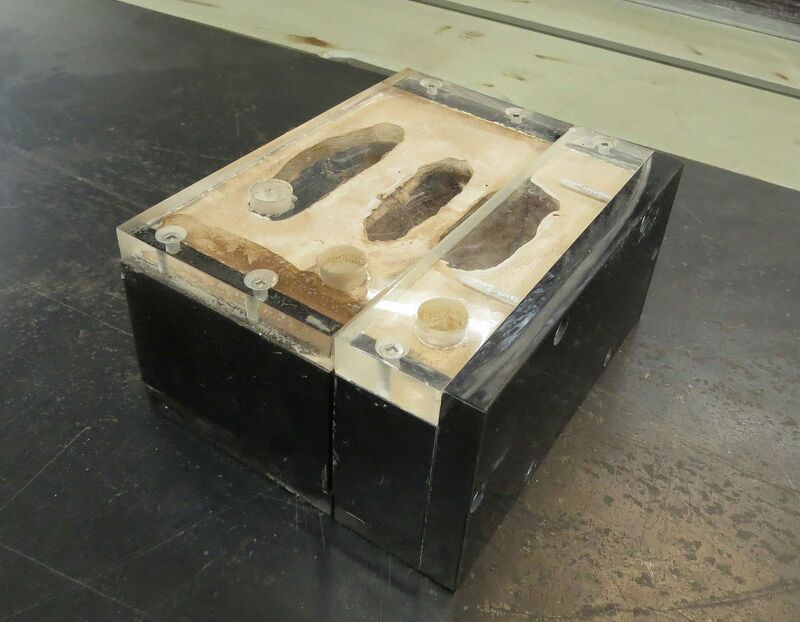 Also note the openings in the hydrostone/plaster against the plexiglass along the top. 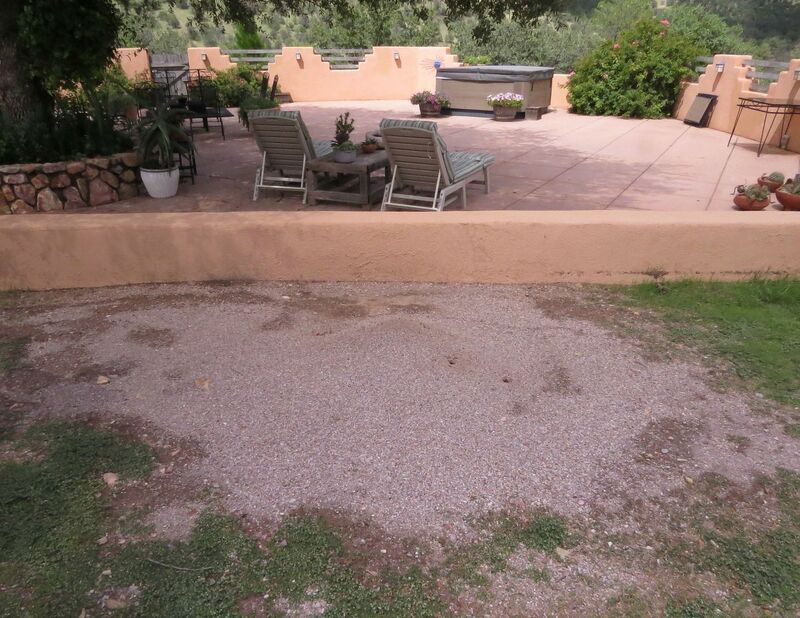 Though empty now, ants can be added as needed. Because the front setup has windows on both sides, you can look all the way through into the second setup. 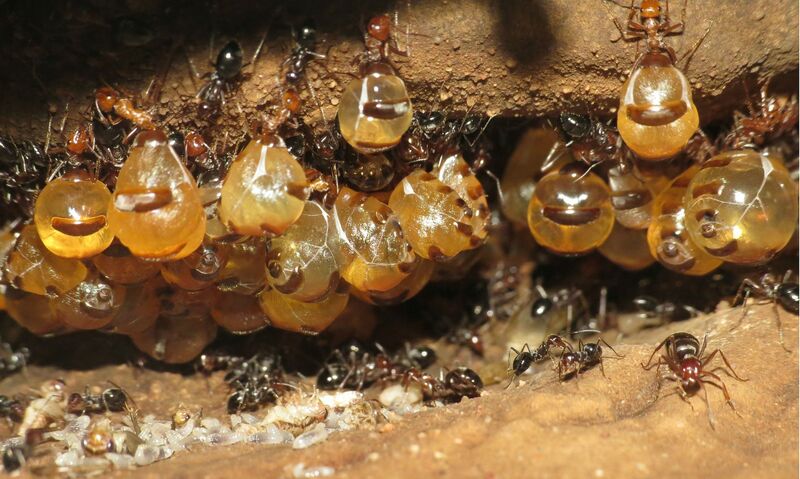 Should a scene call for a wall of honeypot ants hanging in the background, to show the colony is doing well, they just slide that setup in back. 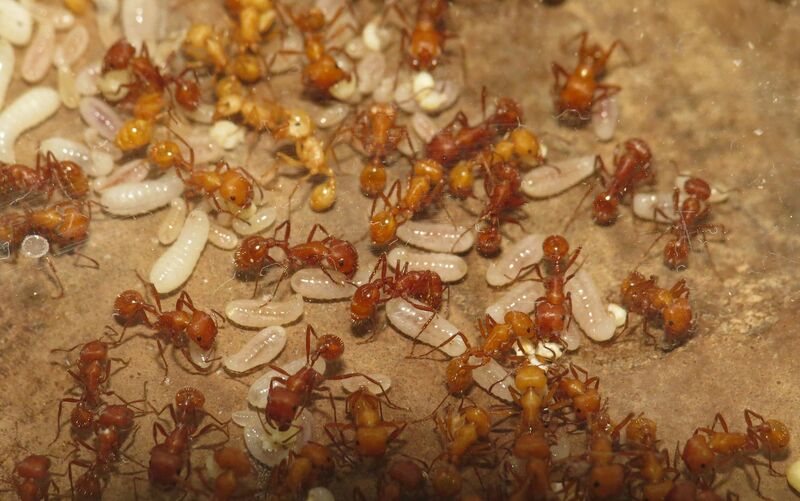 But should the scene call for the colony having to rough it, they can either remove the ants or change the background nest entirely. This is a trick I'd like to incorporate into future setup designs someday. 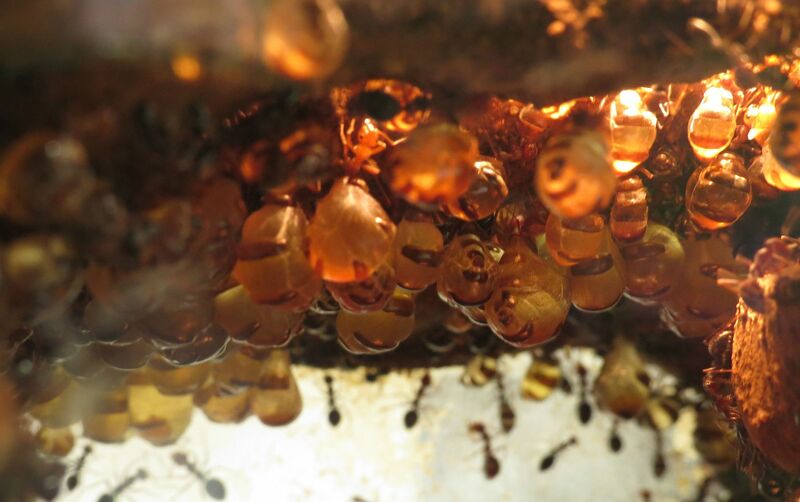 When filming honeypot ants it's always nice being able to make the honeypots glow. 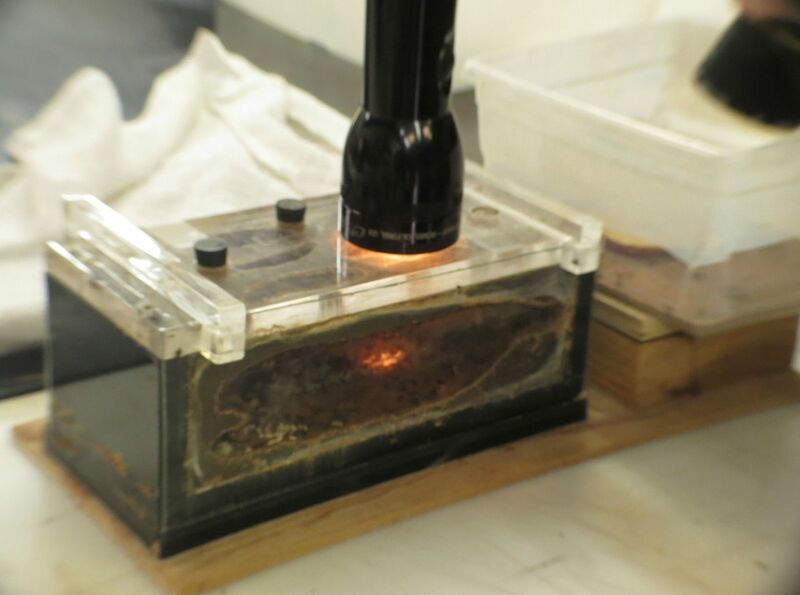 This is achieved by shining a flash light down through the openings in the hydrostone/plaster. Condensation can be an issue at times. 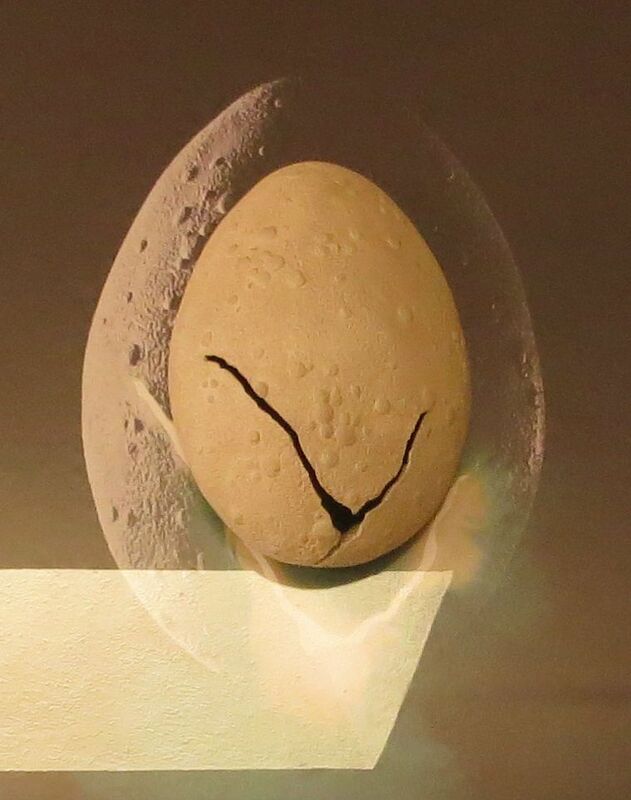 Ray uses a fan, on low, to blow through a tube, sending a light breeze through the nest. 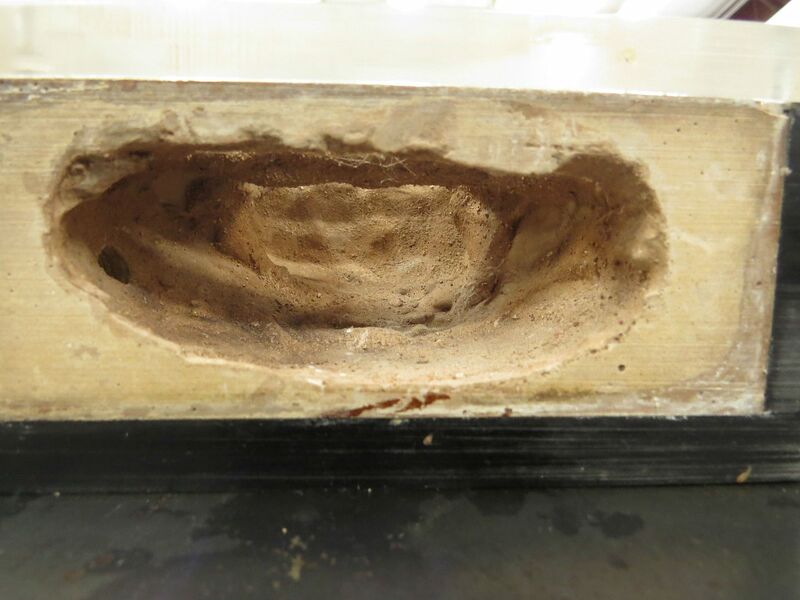 It's important to leave a gap between the fan and the tube, otherwise it will create a wind tunnel and can blow the ants right out of the setup or dry it out too quickly. 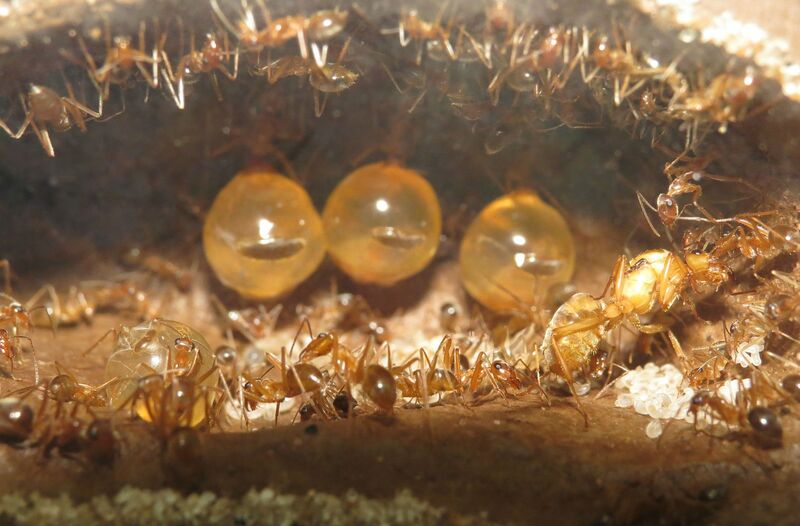 Typically ants don't go through tunnels that have wind blowing through them, but the use of metal mesh might be required. 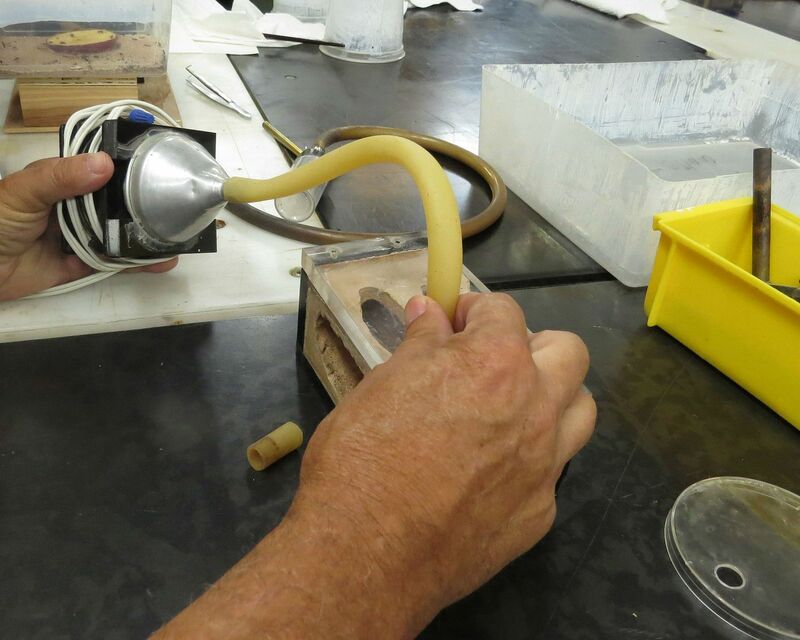 Watering is done by placing a tube through the bottom of the setup when casting. 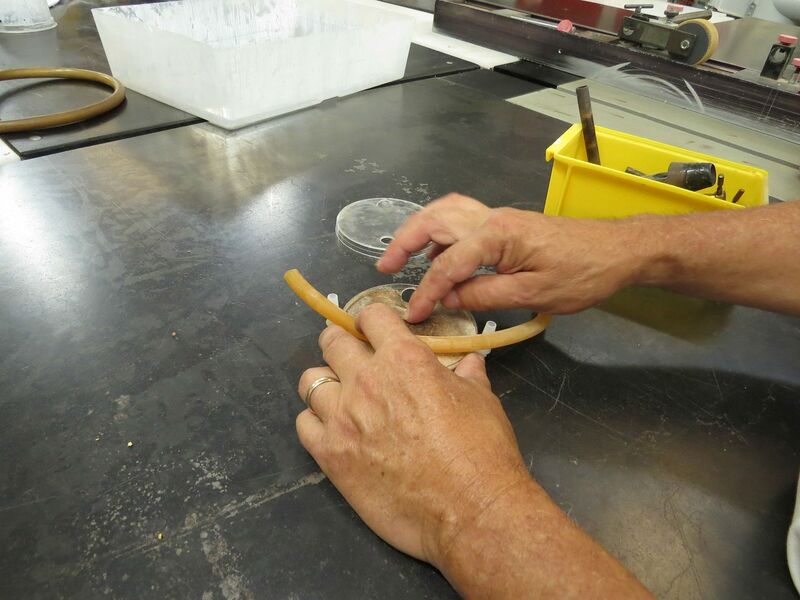 Once it's dry the tube can be removed and the ends replaced by nozzles. 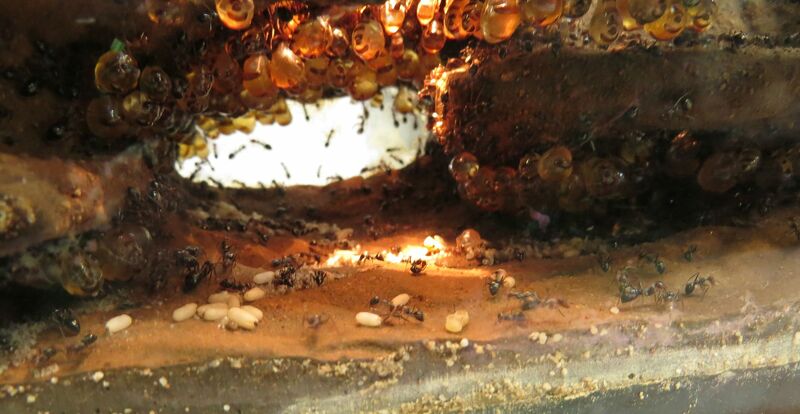 This way water can be added beneath the ants nesting area and allowed to absorb into the rest of the setup. 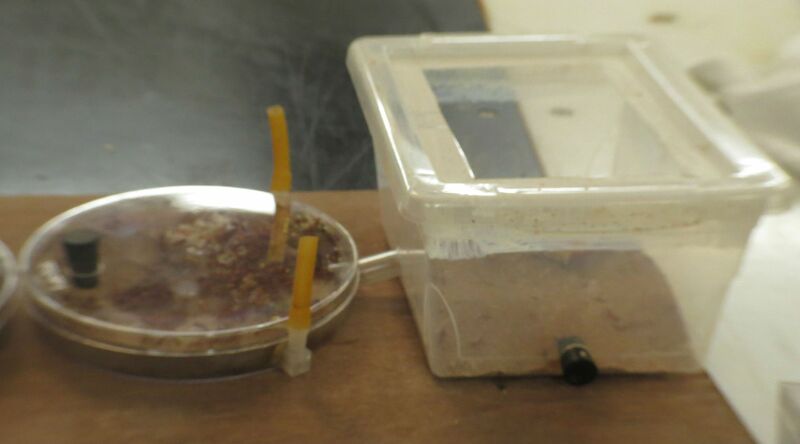 Setups for his personal colonies are surprisingly simple and yet ingenious. 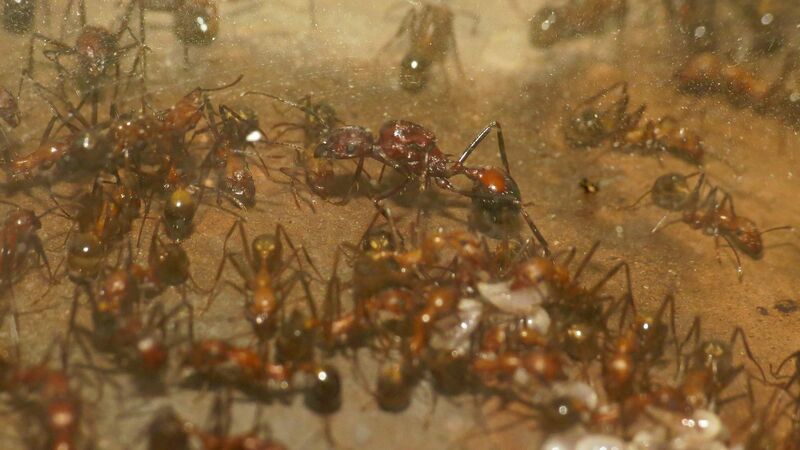 New queens are started in clusteral setups. Plaster lining the bottoms of vented containers. 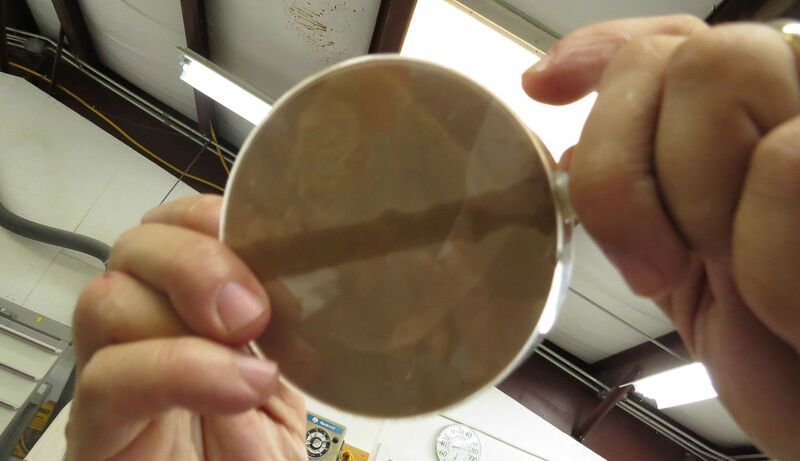 And a VERY THIN LAYER of soil media is added. I emphasis very little because Ray doesn't want the queen digging down into it, or building walls that will only collapse when watered. Also it was nice knowing that even he suffered from the problem "Collect 50 queens and maybe 10 of them are successful." 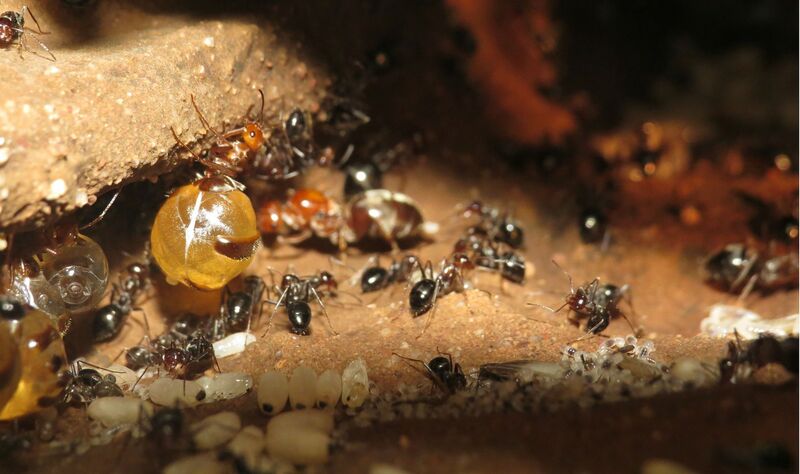 Queens that rear their first workers are moved into slightly larger setups. 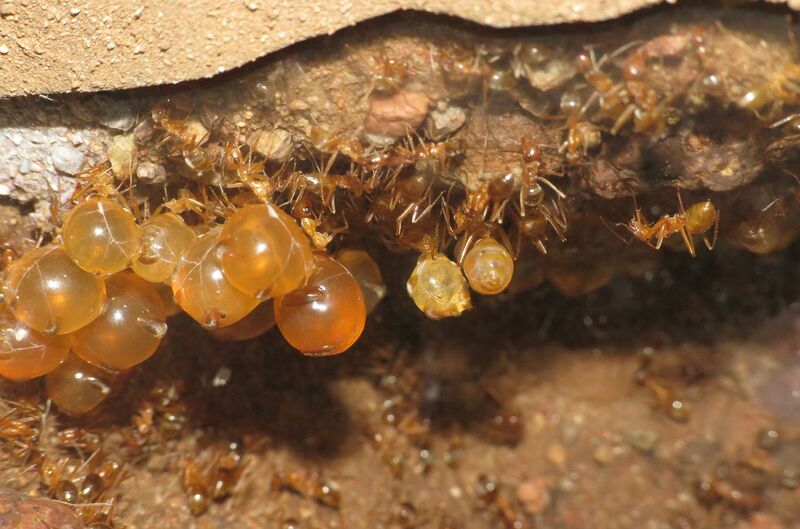 In this case a Myrmecocystus species, Honeypot ants. Upon getting their first few repletes, he upgrades their nesting accommodation as needed. We all got to eat a replete too. There's a trick to it because they're in a subfamily known for Formic Acid. You rupture them first to let the volatile chemicals disperse a sec, and then eat the mess left in your hand. Eating them whole also works but there's an immediate displeasing taste from the formic acid. All his repletes had a taste of apples because he always keeps a slice of apple in the foraging area. The ants nibble at the apple over time, and then place their waste upon it, making clean up nice and easy. All you need to do is replace the apple slice. 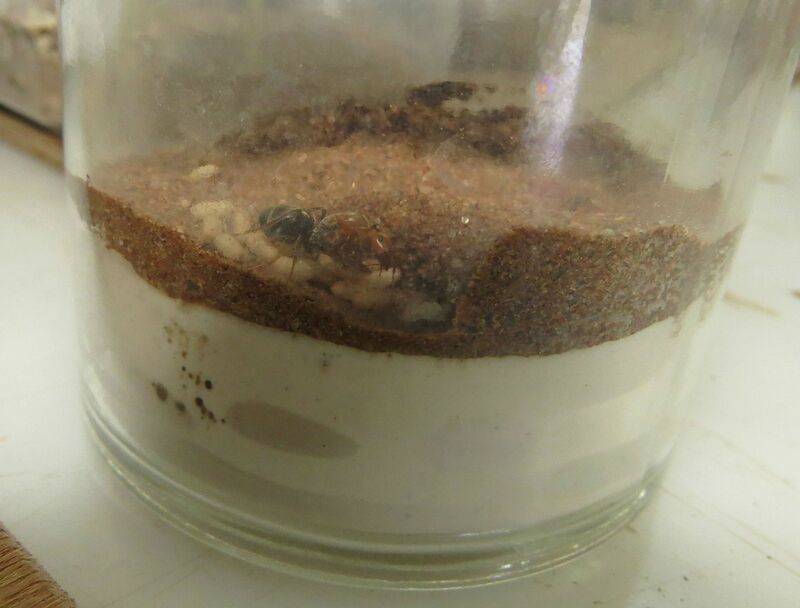 Colonies of Pogonomyrmex, harvester ants, are notorious for stuffing crud and frass right up against the glass. 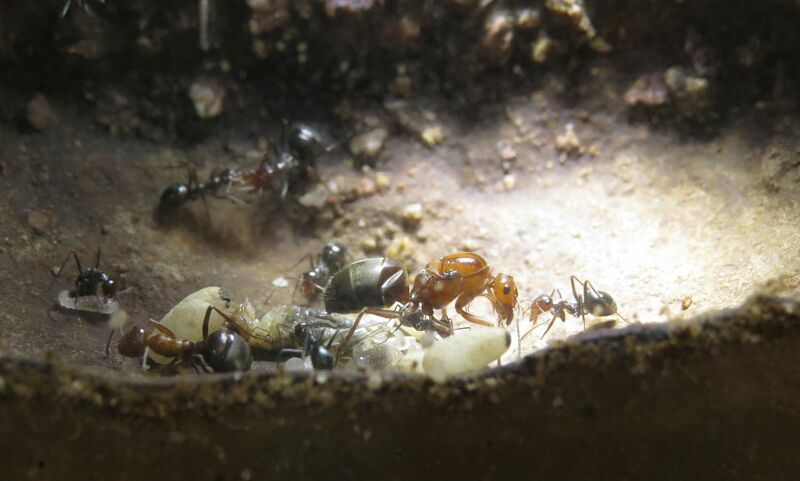 To get around this, he places them in horizontal setups so the ants can be viewed from above. 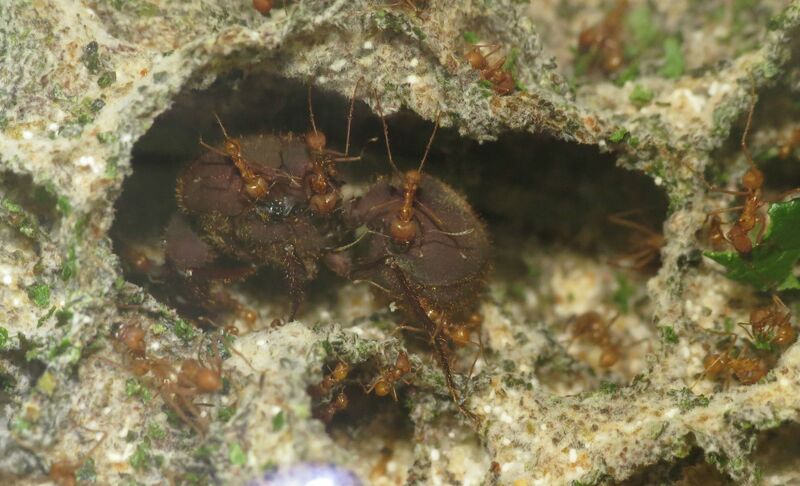 He does this with Aphaenogaster too but but I'm not sure if there was any specific reason for it. 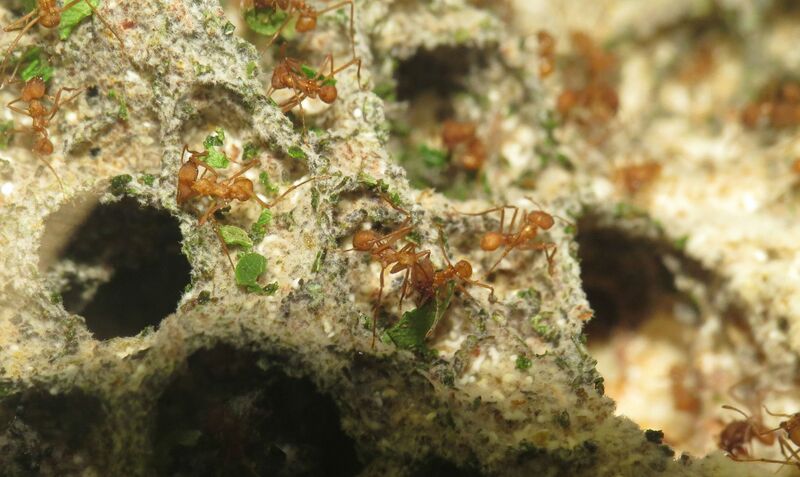 He has a colony of Atta, Leaf-cutter Ants! 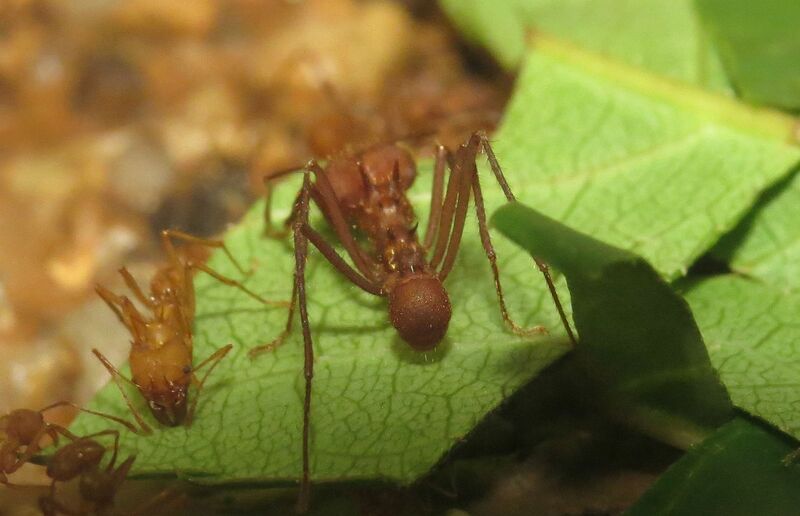 Leaf-cutter Ants cut up leaves to bring home and feed to their fungus gardens. Here you can see the media workers placing little bits of leaves among the fungi. Near the top of the main garden lies the queen. 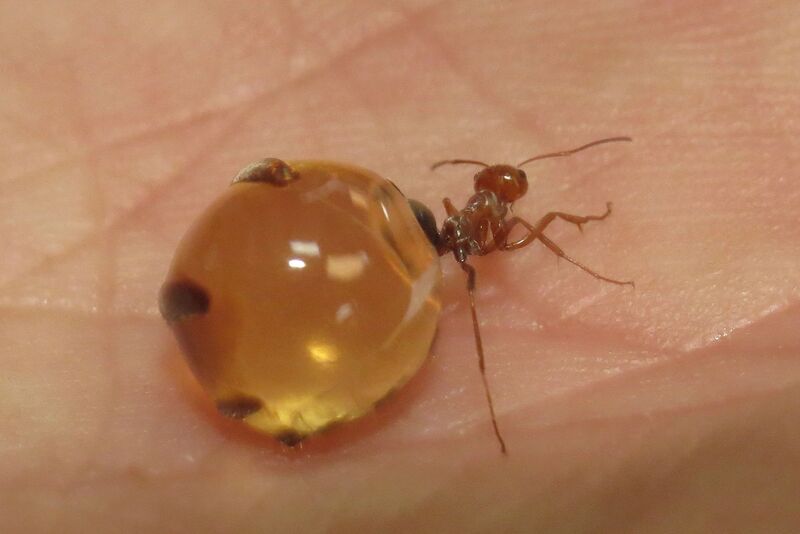 Atta queens are the largest ants in the United States at ~25mm long. 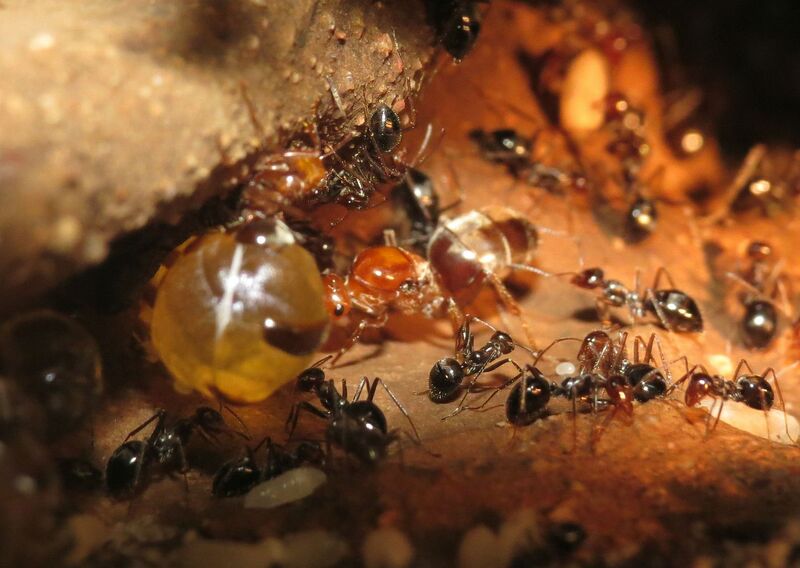 The next closest comparison are some of our Carpenter ant queens that can be as large as ~20mm long. The only real tip he had about keeping fungus ants was to never let them grow their fungus on the ground. New queens just starting out sort of have to make do, but established colonies, even ones with basketball sized fungus gardens don't let their fungus sit on the ground. Often the fungus will grow amongst the roots of plants or on top of stones. 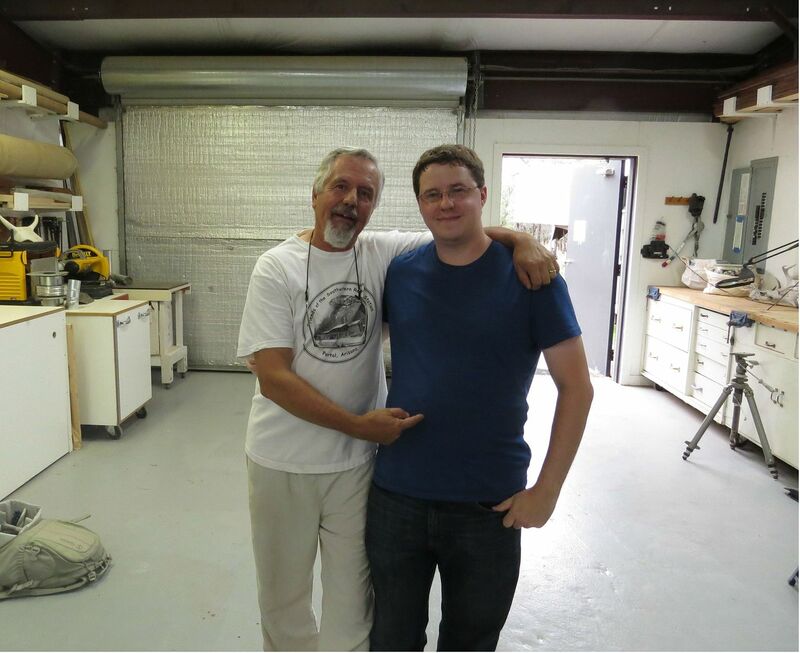 I learned an awful lot from Ray and can't wait to put this knowledge to good use. I'm thrilled to have met him and even asked for his autograph.